Community Supported Agriculture (CSA) projects are a great way for you to support local farmers and get a variety of very fresh, nutritious vegetables and herbs throughout the growing season. You know exactly where your produce come from and the people who grow them for you. What’s better than the crisp crunch of a winter carrot? Or the sweet, candy flavor of frost-kissed spinach? Or a fresh salad mix picked on a cool autumn morning? If you can’t think of much better, then the Crops Winter CSA is for you. Our 2018 Winter CSA will begin October 18th and end mid-December. There will be 7 pick-ups total and we will have at least one break during the week of Thanksgiving. Pickup is on Thursdays from 4:30 – 6:30 pm at our office, 1301 S. 11th (11th and B). Purchase your share before Jan 31, 2018 and get $30 off your share price! 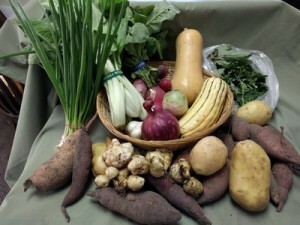 Register for the Winter CSA! Thanksgiving Cornucopia $50 This is a one-time drop box happening the week of Thanksgiving. With the Thanksgiving Cornucopia Share you can expect to receive a diverse selection of greens, storage roots, winter squash, and herbs to help make your Thanksgiving feast a delicious event! Standard Share $200 Designed for a small family with regular vegetable consumption. This share will focus on basic vegetables, often with a twist. Expect staples such as salad mix and carrots, but look forward to some more unusual winter veggies. Veggie Lover Share $250 Our biggest share, which will help feed a veggie-lovin’ family of four or more. The Veggie Lover Share will have both more quantity and more variety than the standard share. Financial Assistance is Available If you are interested in joining Crops CSA but need assistance to cover the cost of a share, please contact us to get more information about financial assistance options. We do accept SNAP/EBT cards for payment and have a scholarship fund that we can allocate to individual CSA members when funds are available. Please contact Matt Pirog at: matt@communitycrops.org for more information. We buy produce from our farmers in training on site at Prairie Pines and off site from around the area. We have a diverse group of farmers to choose from but all of them grow naturally and sustainably! Winter is a challenging season to grow fresh produce in Nebraska. However, nothing compares to the delight of eating fresh food when the sky is gray and the fields are covered in snow. We won’t have tomatoes, peppers, or zucchini in these winter shares, but we will have salad greens, cooking greens, root veggies, and a variety of other cool-weather crops like snap peas and broccoli. We’re working hard to make sure that your share is full of flavor and diversity while growing the crops you love. Of course, the standard CSA disclaimer applies – there are no guarantees that your box will be full every week. However, we believe that this is an important step toward local food security and profitability for our farmers-in-training at Prairie Pines and the farmers we are training off site as well. We’re excited to share with you the cool, crisp, sweet tastes that cool weather brings. Common Good Farm in Raymond offers a certified organic and certified biodynamic CSA in the summer, in addition to a fall harvest CSA. Robinette Farms in Martell offers a vegetables, eggs and poultry CSA. ShadowBrook Farm in Denton offers vegetables, meat, flowers, and cheese through a market-style CSA.